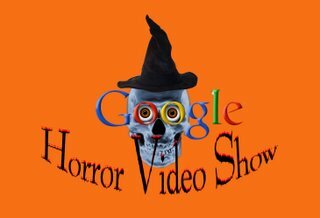 Official Google Video Blog: Introducing the Google Horror Video Show! Introducing the Google Horror Video Show! Today we're introducing the Google Horror Video Show! In honor of a very scary holiday that's just around the corner, we want you to help us find the most horrifying video on Google Video. It could be the type of frightening that makes us laugh-out-loud or the type of scary that makes goosebumps dance around on our skin. 2. Use the "Send to a friend" feature and email the video to us at horrorvideos@google.com by Friday, October 13th. Nominate as many videos as you want! 3. We'll link to the submissions through the Google Video Blog starting October 16th. 4. Vote for your favorite by rating each video! 5. On Halloween, we'll announce the most popular Horror videos on Google Video chosen by you - the audience! * Not satisfied with what you find? Think you can make a more frightening flick? Upload your original videos here and send the link to us at horrorvideos@google.com. Nominate your own video and see what happens! Click here to watch "Ghost Car"
Click here to watch "GPS THE MOVIE - Suspense/Thriller"
This is a trailer to our independent feature film "GPS." It's a fun suspense/thriller! Click here to watch "Ghostly figure in Haunted House in Singapore"